The answer to how quickly and easily we will achieve realizations of the path to enlightenment depends on our finding a qualified virtuous friend, and after having found him how well we devote ourselves to him. Before devoting ourselves to a guru, we should check him well; then after we have made the Dharma connection, we correctly devote ourselves to him with thought and with action. Devoting with thought means seeing the guru as a buddha, an enlightened being, by looking at him in that way; and devoting with action means carrying out the guru’s advice, serving and making offerings to him. Enjoy brief glimpses of Rinpoche on our streaming videos page, including Rinpoche and the young Tenzin Phuntsok Rinpoche at a ribbon cutting ceremony! Also, enjoy these photos from Rinpoche’s travels to Indonesia, India, and Singapore. The FPMT Online Learning Center will be launched in April starting with the second module, “How to Meditate” from Discovering Buddhism. To easily enable all members and friends to view the content of this module, our new site we will offer this module for free. The twelfth module, “Wisdom of Emptiness,” will also become available in April. More information, including how to access the Online Learning Center, will be shared at the CPMT meeting and in listserv messages following that. A new Retreat Prayer Book has been prepared for personal use and for all upcoming retreats with Rinpoche. This book is the result of input and observation made over the last five years of retreats with Rinpoche and will be launched at the Mani retreat (IVY, May) in English, French and Spanish. Also, the long Chenrezig sadhana will be available in English, Spanish and French, the short sadhana in English, Spanish, French, German and Italian, and the Lama Chöpa long life puja (that will be offered to Rinpoche at the end of the CPMT) in English. For this heroic effort that will benefit so many we especially thank Ven. Gyalten Mindrol, Luis Portillo, Ven. Tonden, Rafa Ferrer, Elea Redel, Conni Kraus and Ivano Columbo. We give our apologies to anyone who tried to purchase our new Escaping your Inner Prison CD, a concise teaching by Lama Zopa Rinpoche that describes the real prison of samsara and presents the essential elements for a successful daily practice. There was a mistake in the formatting of the disc which has now been corrected. The CD is now available in the Foundation Store. To translate and make universally accessible the Buddhist literary heritage. To translate and make accessible all of the Kangyur and many volumes of the Tengyur and Tibetan commentaries. To translate and publish a representative sample of the Kangyur, Tengyur and Tibetan commentaries and to establish the infrastructure and resources necessary to accomplish the long-term vision. On behalf of everyone, FPMT staff and volunteers attending the CPMT in France will be offering a special long life puja for our most precious and beloved Guru. The puja will take place on May 2, at Institut Vajra Yogini. (This will be additional to the yearly event held at Kopan Monastery in November). Please consider making an offering to support this amazing event. 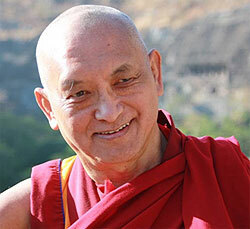 This account of the day in the life of Lama Zopa Rinpoche comes from Ven. Thubten Jinpa, Kopan Lama Gyupa, who has often served as Rinpoche’s second attendant and was with him recently in Dharamsala, India. He writes on March 14, 2009: “I am sure this needs some editing, but I wanted to mention that the point of the account should be kept intact. The feeling I experienced was real, not something I made up only with words. All I want is to share how each of Rinpoche’s actions are the true copy of those great master bodhisattva’s actions which we believe in only by hearing about them and seeing them described in the texts, but are rarely seen in person. I really hope that this account will be a good inspiration for all. “After a long and busy tour in south East Asia and south India, we have come to this little valley of Himachal, a state of north India, due to a sudden change in the schedule. Kyabje Lama Zopa Rinpoche, myself, Ven. Sangpo and Ven. Kunsang are staying in a house owned by a very old student of Lama Yeshe and Lama Zopa Rinpoche – Jimi, a nice guy in his 60s. His house is made of all the material available around him such as mud from behind his house and bamboo from the nearby forest. The house is located just at the bottom of mountain below the small hill station in Dharamsala. It’s so quiet and peaceful; we’ve had no visitors and no more appointments since we’ve arrived here. “Rinpoche put more Christmas lights inside and outside which has made the little house a temple of lights. We have come here to attend teachings by Denma Locho Rinpoche. The venue for the teachings is a twenty minute walk away in Gyuto Monastery. I feel happy to be in this environment as it reminds me of my home Rolwaling. We have planned for Rinpoche to walk everyday back and forth from the teachings as it gives Rinpoche some chance to have bit exercise which helps to bring his blood sugar levels down. I am excited to walk through the rice paddies and barley fields with Rinpoche every day. “It’s a wonderful morning. The sun is just rising and its first rays have hit right through my window. Unfortunately, I didn’t hear my alarm clock. It felt like I had only just gone to sleep but it is 5:30 a.m. already. I go to Rinpoche’s room hoping to see him resting as we had just come back from Tushita at 3:30 a.m. after a long teaching followed by guru puja. But to my surprise, the holy guru is already sitting in meditation! Now I begin to panic and rush back to the kitchen to make a cup of tea. “At 9:00 a.m. the tea that was offered at 6:00 a.m. is reheated for the third time, the bowl of porridge near Rinpoche’s bed is cold as ice and the two slices of toast are hard as stone, yet the holy guru seems not aware of the breakfast sitting there for him. “At 10:00 a.m. I hear the bang of the bathroom door. I enter Rinpoche’s room to now find only half a bowl of the porridge and one slice of toast. “Many times Rinpoche runs around the relics. He always emphasizes that the best method to help sentient beings is by helping them to purify the negativities by the power of holy objects. Rinpoche seems to have unbearable compassion in his heart for that little creature and feels so concerned about its safety. “I am just happy because at least Rinpoche is getting some exercise. “I keep reminding him of the time, always keeping at least 10 minutes ahead of the correct time so that I don’t panic later. Rinpoche knows the actual time and he has not shown any sign of moving. He is still reciting his prayers and I know it will be followed by hundreds of long prostrations. The time is getting more and more close to 2:00 p.m. and I remind Rinpoche of the time four more times. I am hoping that as soon he comes down from his room that he will sit at the dining table for lunch, but instead, when Rinpoche comes down, he runs straight outside where the water and food are ready for preta offerings. “Rinpoche spends all his lunch feeding the pretas. I don’t know who else was invited. “There is not even 15 minutes left until we have to leave. I am happy that it is just enough time for Rinpoche to eat his lunch properly. I am wrong again. 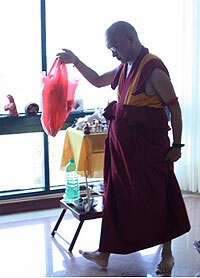 Instead Rinpoche spends that time making extensive offerings. “By the time he comes back to the food that is waiting on his plate, time has run out and we have to go, but I pretend that we have enough time so that Rinpoche can at least have a proper meal. “As an attendant my priority is to try to look after Rinpoche’s meals and other private needs, particularly as Rinpoche seems to take care of himself last. “Then Rinpoche says ‘let’s go’ even before half of his plate is empty. Although my mission was for Rinpoche to walk and have some exercise, time has run out, and poor Jimi has to run to get his little Maruti. During the ride, Rinpoche asks him twice to increase the speed. Sometimes the wheels touch the road and other times just two wheels touch. We make it just before the actual teachings begin. Hearing the chant of the mandala offering from the gate of the monastery makes Rinpoche run faster. “The teachings begin with the powerful voice of Denma Locho Rinpoche. The powerful amplifier that belongs to Gyuto was imported from California and helps his voice be extra dynamic. Denma Locho Rinpoche is teaching about the three compiled teachings of Geshe Potowa, the great Kadampa practitioner of 16th century. “The teachings are so powerful and moving to the heart, yet very simple. In between the oral transmission of the teachings, Rinpoche tells the story of the author. It is said that Geshe Potowa is not someone who is scholar, nor are his teachings very philosophically profound or vast. His teachings are simple yet they benefit so much to others, by moving their hearts. Even when Geshe Potawa tells the story of birds or animals it makes a great impact on people’s minds. “Geshe Potowa is also called long me thug la trung pi potowa, meaning ‘Potowa in Whose Heart the Realization of No-Time Has Been Achieved,’ for Geshe Potowa never had the time for non-Dharma activities. He would constantly meditate or give teachings to others, otherwise he did prayers constantly. He was always in a hurry to do Dharma practice saying: ‘I should do Dharma now otherwise I shall die soon.’ For him everything he saw or every incident that happened in his life was a means of teaching or subduing the mind. “This is all about the great Geshe Potowa of 16th century, but now I think that Geshe Potowa still exists in this world, in this degenerate time of 21st century. Furthermore, I am convinced that our guru is no other than Potowa. “Denma Locho Rinpoche said that Geshe Potowa, because he had no grasping at all for his own self, never cared for his meals, health and clothing, and of course no question for shelter because his Dharma practice was placed ahead of every comfort of this life. “As soon I heard this I realized why Lama Zopa Rinpoche often mentions the animals he sees on TV, such as on the Animal Planet or the National Geography Channel during his teachings. I wonder why Rinpoche needs to spend hours talking about how and what the little creatures do, but now I understand that for Rinpoche all those things are not merely TV shows, but rather are direct teachings to develop bodhichitta and an understanding of karma. “By the time we reach home it is almost dark. A cup of tea and some snacks are waiting for Rinpoche, but they are just ignored. 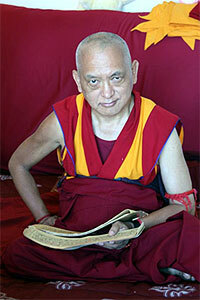 Rinpoche sits down and begins to open the texts around him and starts to jot down notes. “One of the main areas we focused on was sharing and cooperation, and it was so amazing to see how everyone embraced it, as there has always been a little resistance in the past. 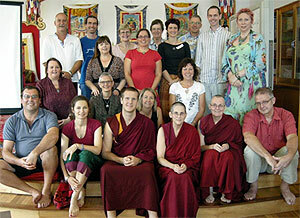 The ‘family feeling’ was also nurtured and encouraged, and we all felt part of a larger FPMT family. People were more willing to share their resources, and there was a general feeling of wanting to secure all the work that has been done by individuals and pool it together as shared resources for the group so that in future people don’t have to reinvent the wheel. There was a large range of topics including policies, education materials (notes from course leaders that supplement the Education Services’ work), technology information, taxation information, and the list goes on. Jangsem Ling Retreat Center (JSL) in Traing, Malaysia, accumulated 7 million recitations of the six-syllable compassion mantra, dedicating for Lama Zopa Rinpoche to have a long, healthy and stable life. 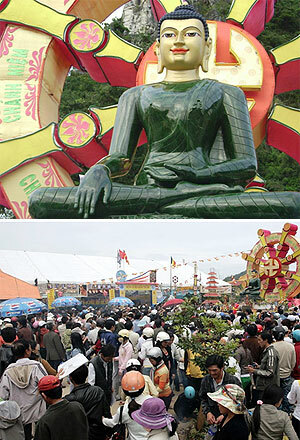 The Jade Buddha for Universal Peace commenced its world tour at Quan The Am temple in Da Nang, Vietnam, March 13 – 15. The Jade Buddha is scheduled to visit five more temples in Vietnam and invitations have been received from several other temples and events. It is estimated that well over 1 million people will see the Jade Buddha during its tour of Vietnam. Opportunities include an experienced cook at Nalanda Monastery, France, work opportunities at Mahamudra Centre, New Zealand, and Spiritual Program Coordinator at Thubten Norbu Ling, New Mexico, USA.